This is a post tribute to Michael Jackson. I am not sure whether I am a fan of him or not, I think I am. I know about Michael Jackson when I was like 5 years old, daddy had a few CDs and VCDs of him and I watched it last time. I like his song, I like his dancing, I don’t really about his appearance from black to white and his child molestation accused, it’s weird but somehow he was and is still the King of Pop. Look at his concert, there’s like tenth of thousands of fans at every of his concert and I saw once before that some of his fan fainted at his concert. It’s just incredible, his power, his attractions, everyone was like so crazy about him. 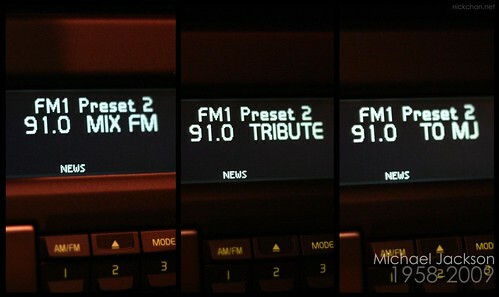 Mix FM is playing Michael Jackson’s song for a whole day. His death was so unexpected and shocking. I was going to school this morning and just when I arrived at school, the radio DJ announced his dead and I was shock by what I heard. I quickly checked the news through my phone and it’s true. It’s just kind of unbelievable. He was there in London few months back, looking good and not old, and he is gone now. He was supposed to have a concert in July in London but no one really expected his death at this time. 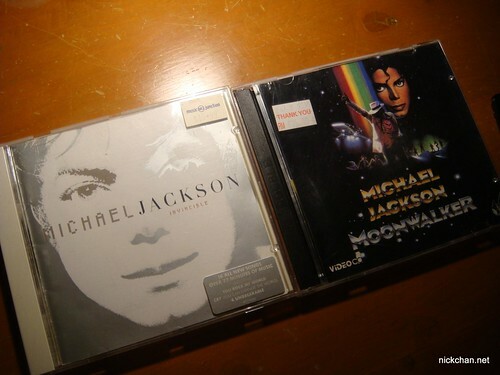 2 MJ’s CDs at home. When he announced his Final Curtain Calls concert, I was wondering how could he dance while he was ill, but he didn’t look ill on any part of his physical outlook. He was just great. Well, he is gone right now, physically, but he, will still always stay in our mind. 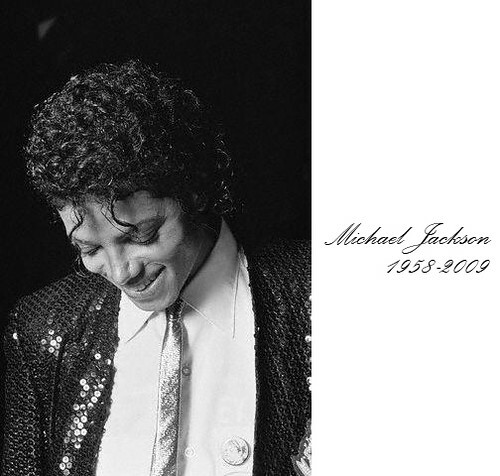 He is just King of Pop and at this moment, I believe no one could replace his King of Pop title, yet.